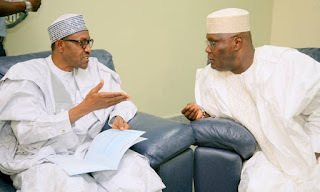 Ex-Aviation Minister Femi Fani-Kayode has described former Vice president Atiku Abubakar as the All Progressive Congress (APC)’s greatest fear for 2019. According to Fani-Kayode, hate comments from some APC governors have proven this, adding that they are deeply hurt by Atiku’s defection to the Peoples Democratic Party. 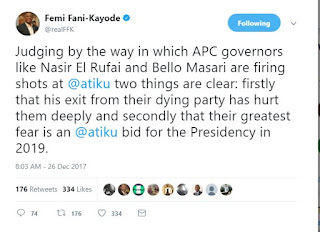 He noted that the attack from APC governors was as a result of fear of Atiku in 2019. 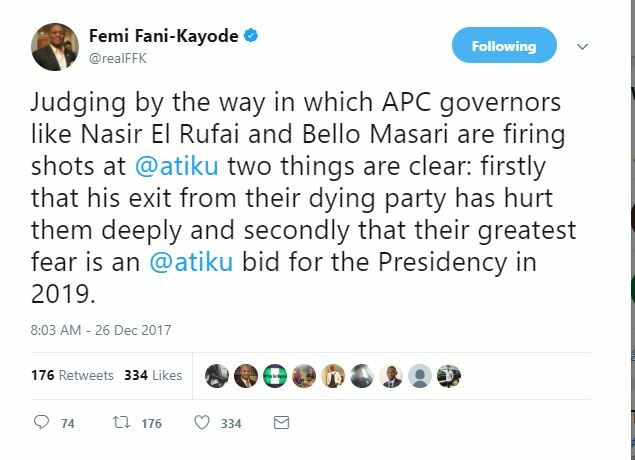 “Judging by the way in which APC governors like Nasir El Rufai and Bello Masari are firing shots at@atiku two things are clear. Firstly that his exit from their dying party has hurt them deeply and secondly that their greatest fear is an @atiku bid for the Presidency in 2019,” he tweeted on Tuesday. Atiku had earlier this month rejoined the PDP, citing APC’s failure to fulfil its campaign promises.